Off A9, between Tain and Dornoch. Located on the edge of the beautiful Dornoch Firth with views of the Struie Hills, the 8,000-acre Skibo Castle estate is something special, very special. It’s a place where fairytales meet reality. Schytherbolle, its Celtic name, roughly translated means fairyland. But it wasn’t always like this – there was once much bloodshed when Sigurd the Mighty and Thorstein the Red, the early Nordic settlers, descended upon Dornoch. Things are much calmer these days and a trip to Skibo, whilst making a dent in your wallet, will make you temporarily feel like a millionaire. In 1898, the original Laird of Skibo, billionaire Andrew Carnegie, commissioned Royal Dornoch’s Secretary, John Sutherland, to build a private nine-hole links course. But after Carnegie’s death in 1919, Skibo Castle and the golf course soon became fallow. British entrepreneur Peter de Savary bought the Skibo estate in 1990 and he asked Donald Steel and Tom Mackenzie to resurrect a links. In 1995, a new Carnegie Club links at Skibo Castle was born. US billionaire Ellis Short bought the club in 2003 and Tom Mackenzie was re-commissioned between 2005 and 2007 to alter the original design – aided by David Thomson (Skibo’s Director of Golf) and Gary Gruber (Course Manager at the time, now Estate Director). Gorse, which lined a number of holes, was removed and the landscape reshaped along with rebuilding and revetting every one of the seventy-two bunkers. In total, eight holes were refashioned, including the opening of four new holes. The updated new millennium Skibo, which stretches from 5,400 yards to more than 6,800 yards, contains many tough holes at the start of the round, but the best of the bunch by a long way is the wonderful par three 6th, it's a magnificent short hole with its elevated plateau green which is guarded at the front by a deep, threatening bunker. There is a slight lull in proceedings around the turn before the dramatic three closing holes kick in. The 17th is a risk-and-reward gem, a short par four measuring 304 yards from the back tees with the green definitely in reach, but you’ll need to flirt with the beach and the deep bunkers guarding the front of the green. The 18th, a sweeping par five, concludes a memorable and varied round. The hole doglegs left, hugging the salt marshes. Big hitters might reach it in two. In June 2012, for the first time since becoming private in 2007, the Carnegie Club at Skibo Castle announced that limited public tee times will be available on special request. Click here for more details. If you’ve not played the Carnegie Links at Skibo Castle since around 2008 you’ve not really played “Skibo”. 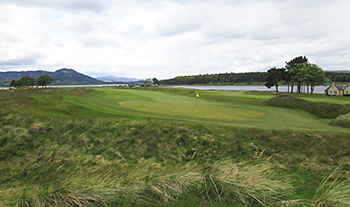 The current version of the layout was designed by Tom Mackenzie under the watchful eye and guidance of PGA Professional and Director of Golf at Skibo, David Thomson, around a decade ago. With no expense spared they have taken the previous re-design of the early 1990’s by Donald Steel and have turned it into a golf course that can now be talked alongside the upper echelons of links golf in the UK. In summary the changes saw myriads of gorse, trees and other shrubbery cleared to expose a links course that now contains a bountiful amount of strategy and beauty. When I say no expense spared consider the movement of 300,000 tonnes of sand to re-build the second hole! The all-encompassing property has a celestial feel and a truly diverse fabric which blends together flawlessly to create unparalleled golfing terrain. For most of us a visit will provide a glimpse into another world, certainly away from the course. The term ‘millionaire’s golf’ will never be more prevalent than at Skibo. I didn’t quite make a millionaire’s entrance myself… erroneously arriving at the ‘Goods Entrance’ thanks to my Sat Nav (arguably user error!) and then ending up in the staff car park! The upside of arriving at the Castle – the former residence of Andrew Carnegie - instead of the clubhouse was that I got an escorted journey through the scenic Carnegie Estate by one of the stylish black Range Rovers that are stationed in line outside the impressive 19th Century building. The golf course itself can be easily split into two sections because the feel and style of each one is so different. Holes 1 to 10 and 11 to 18 offer two contrasting types of links golf. The first two holes provide a real championship feel and lead us nicely into the front nine. The exceptional build-quality, appearance and positioning of the bunkers are immediately noticeable and any fears about how good the golf will be are quickly laid to rest at this pair of excellent two-shotters. The 3rd and 4th weren’t my favourite holes on the course (the latter will soon be altered to provide more visibility) but they keep things moving nicely before we hit a stretch of golf that is arguably unrivalled. Holes five through ten simply do not miss a beat. They are infinitely beautiful and strategically supreme. They sum up perfectly the type of golf I personally love. For the final eight holes you play right alongside, or at least very close to, Loch Evelix. The setting is equally as beautiful as the front-nine but in a different kind of way. The holes have a more manicured, tranquil feel in nature but still play linksy and the quality of turf, which is tight and pristine throughout, is still there. The bunkering is a little cleaner and the changes in elevation slightly less. I personally preferred the front nine but I suspect others will enjoy this section more so. Are there any negatives? I hear you ask, especially since you may be forking out the most expensive green-fee in the United Kingdom. I tried to think hard for things I didn’t like (it wasn’t easy) because I’m sure anyone considering playing here would surely want to know. Well, the course certainly isn’t without fault but in the grand scheme of things these are very minor. My main personal niggle is that the routing wasn’t quite as seamless as one might hope for. Long walks from tee-to-green are the norm nowadays at most modern 7,000-yard layouts but here you must awkwardly cross the 3rd tee to get from the 5th green to the 6th tee, you must also walk back almost the entire length of the 150-yard 13th to get to the 14th tee and you need also to cross the front of the clubhouse to reach the 16th tee. It’s not a game spoiler by any means but in an ideal world the flow would be better. There is also a long walk to play the isolated 7th and 8th but this is countered by the fact that it is through a mysterious looking lichen heath which actually adds to the charm of these two handsome holes so is easily forgiven. The inward stretch alongside the loch is surreal and contains some fine holes but the 11th and 12th both have a similarity about them visually and strategically; notably heroic drives over the water. Both are lovely holes, it’s just a shame you must play them consecutively. Finally, the second shot on the par-five 3rd could maybe do with a bunker or two 50-yards short of the green to makes things more interesting (for either the lay-up or if trying to to go for the green in two) and the 18th tee shot is just not for me; in my eyes it looked a bit too manufactured but I can imagine others will love the heroic nature of this shot which plays over a tidal inlet. However, none of these things, all considered from an uber-critical perspective, should not deter from you visiting Skibo. Ultimately there are many, many more things to praise Skibo for than to be damning. Their attention to detail both on and off the course is second to none. I played the course towards the end of the hot and dry summer of 2018 and I am afraid the course was not great, with both fairways and greens in poor condition. In a year where I played 52 of 'Scotlands top 100' this was definitely the worst conditions I faced all year. The layout is great and the clubhouse service is first class, as you would expect. However I felt a little let down, I think courses should flag up their condition when charging full price, to allow you to decline. In another year, with more supportive weather, I have no doubt this would be an excellent track. Several holes were fantastic in their layout and I look forward to the day I return and play the course in better condition. I very rarely question the rankings on the website but I am staggered that Skibo is at 84. I'm sorry but Today's Golfer has it spot on at 25. I've played over 90 of the top 100 and this course should be low first quartile or high 2nd. It seems also that my views are replicated by a number of others (with the notable exception of David Worley who rated the course 4 stars - bad day on the links David ?) - yes I know it's an opinion based assessment !!! I'm just surprised it's not rated higher considering the number of stellar reviews. It is a majestic golf course with memorable holes everywhere in fact all are ! Holes 7 and 8 are stunning consecutive duo set on the water. Water runs to the right of holes 11 to 15 then again on 17 and 18. Great variety also from a drivable par 4 17th to a near 500 yard par 4 - same with the par 3s. The par 4, 16th is, in my view the best hole on the course and would not look out of place on any of the links Monuments. The only slight negative (and I say that loosely as they are both superb holes) is that 11 and 12 are both par 4s that move left to right. The whole experience is worth the fee. In summary, I could happily play this course every day of the rest of my life. Good day on the links David ? I usually miss those and sign for a 95. Ironic you make this comment now because just last night I was reading James Finegan’s account of playing up at Skibo Castle, where he suggests “Donald Steel has captured in a contemporary Links the true feel and challenge and spirit of traditional seaside golf”. I recall trying to see where Carnegie fits in my rankings and when I reached Goswick I knew that for me, Carnegie, had reached its limit. An argument could be made that Carnegie is a top 40 GB&I course. I was pleasantly surprised after my only game. However, when I look at the courses I place higher it is safe to say Carnegie is in good company, even if it doesn't quite make my top 50. The front nine hums along, however, once turning for home the quality turns a bit south...starting with the incredibly similar 11 and 12th. That isn't to say 11-18 is a poor grouping of holes, but there isn't much I find compelling. Played Skibo twice, most recently in 2016 and it's style over substance in my opinion. Skibo has some stellar holes most notably the par threes but there are a too many mundane ones after the turn and the Americanized closer around the lake is akin to a chilly Florida rather than a Scottish links. Simply looking at the North of Scotland rankings, I'd place Brora, Lossiemouth and Askernish ahead of Skibo. No way is Skibo Top 25 in GB&I even if you factor in the overall opulence. I was very lucky to have played at Skibo Castle while on a golf trip to Dornoch. There are only 2 tee times per day available to the public and that seems to be a fairly well kept secret. The whole experience of playing Skibo is different class. I've never enjoyed a golfing experience quite as much as the day we spent here. First off, once the green fee has been paid everything there after is free. We arrived and had a round of Gin and Tonics, no charge, all part of the service at Skibo. Next we went into the dressing room to find lockers fitted with our names, a very nice touch. Use of the range was complimentary too which we took advantage of. After hitting some balls we sat down for lunch and got ready for our round of golf. For the entire round we saw 2 other 4 balls, the caddie's serious response was that this was the busiest he'd ever seen the course. There is a half way hut at Skibo stocked with all the usual food and beverage for you to help yourself to, of course, all complimentary. The course itself was in fantastic condition, possibly the best kept course i've ever played. I honestly didn't see a divot anywhere. The grass tracks between tees and greens are in as good a condition as most golf courses greens. Its a really fun track to play too. Considering its a new design they've done a great job to make it feel like its been there forever. Lots of waste bunkers and then proper pot bunkers on the fairways and greens. I can't remember a weak hole but the final 2, 17 and 18 really stand out. 17 is a short par 4 which is reachable in 1 depending on the wind, 18 is a great risk reward par 5. The greens run fast and true while the rough isn't like any rough i've seen on a links course before. The rough looks long and intimidating but when you actually get into it, its not thick, it just has long whispy grass growing. Its actually quite easy to find your ball in and not overly tough to play out of. I thought it was great and made for a an extra fun round as you knew that only a really offline shot would get the worst punishment. One of the stand out things for me about the course is the feeling of remoteness. Apart from Carnegie's Castle and the clubhouse there's literally no civilisation in site. The views of the mountains and the surrounding lakes are just as gorgeous, the types of views that will stick with you forever. My lasting feeling was that this course was better than both Royal Dornoch and Castle Stuart. I know they come higher in the rankings but for me this was the best of our trip. The course is absolutely top grade and i'm sure if they were interested in getting the course up the rankings they could easily break it into the top 20 of the world. I played all 4 courses at Bandon Dunes about a month later along with Pasatiempo while in the US. All of those courses are in the world top100 and this course is better than all of them. 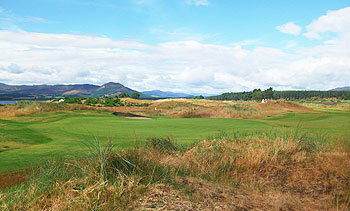 Pacific Dunes was the closest but its not in as good a condition as Skibo and that ranked 16 in the world right now. My last comment on Skibo is that although its very expensive, it somehow feels like value for money when you leave. If you can stretch yourself to pay the green-fee, do it, you won't be disappointed. "and i'm sure if they were interested in getting the course up the rankings they could easily break it into the top 20 of the world". Not sure this is their choice to make - usually down to fairly independent reviewers, and even the most private of places get their rightful place in the rankings if the course warrants it (Pine Valley, Cyprus Point, Augusta, etc). It does sound like a good experience though and glad you enjoyed the day though! I managed a game at Skibo Castle yesterday with three other golfers, two of whom hadn’t played the course before and one who was last here ten years ago. Everybody was keen to see just what it was that had recently propelled the layout into the upper echelons of Scottish and GB&I ranking lists with a number of other golf publications. I know I was certainly in raptures when I last visited almost three years ago, discovering that the layout had vastly improved since my first visit in 2008. This time, although it was the first day of June, it felt more like late Winter/early Spring, with a cold wind blowing and blustery showers passing through on a regular basis. Consider also that growth in the area has been really slow this year because of the cold weather and you can understand why we didn’t see the course at its very best, which was a real pity. That didn’t detract from the quality of the layout, of course, where the excellent par three 6th and short par fours at 7 and 8 remain my favourite sequence of holes on the course. Holes 11 to 15 around Loch Evelix still don’t enthral me as I find the fairways really flat and a little repetitive, basically requiring you to avoid water all the way down the right hand side on every hole. The closing triangle of three holes does lift the spirits again, though, especially at the driveable short par four 17th, which is far tougher than it appears from the elevated tee box. I understand that Jack Nicklaus visited in recent times and had good things to say about the course so an endorsement from the Golden Bear is not to be sniffed at. I thought Skibo could make the Scottish Top 20 last time I was here and it subsequently soared from 34 to 19. It’ll be interesting to see where it’ll be placed in the next edition of the chart, published later this year. The magnificent castle and surrounding estate was completed for Andrew Carnegie at around the end of the 19th century. It remained in the Carnegie family until 1981 when Andrew’s daughter Margaret, due to her own failing health, instructed that the estate be sold. Sadly it fell into disrepair but then in the early 1990s, the new owner, Peter de Savary, embarked on a major repair and upgrade which included the building of a new 18-hole championship course in this stunning location, regarded by Andrew as “heaven on earth”. All the par threes were challenging with the 6th being particularly difficult to hold the raised green. The 9th is very demanding at 215 yards from the back tee and has a large pot bunker guarding the front left of the green. The 13th and 15th each have water in play all along the right hand side. The 18th is a picture perfect par five with a sharp dogleg left. If you are left of the fairway with your drive then you are in the salt marsh. You then have an estuary from the Dornoch Firth all the way to the green. The stately baronial castle is nestled in the trees on the other side of the estuary. Just back from a weekend golfing at Royal Dornoch and at Skibo ,i had looked at all the ratings of these courses before I left and now after playing them I have got to say Skibo is ranked way higher than its 19th place ,I have only got Muirfield,Loch Lomand and Kingsbarns left to play in the top 20 so not including them Skibo is the best of the rest in terms of condition, toughness, presentation, variety of holes, shots where all the tees are positioned is very playable for all handicaps,the layout and where it is situated is absolutely awesome the friendliness of all the staff the whole package is second to none. Myself and my golfing partner both agreed it is a far better course than its Royal neighbour . I read a recent review from a Carnegie Club member on this site and thought that, although the arguments for 6-ball status were well thought out, it was maybe just a typical club member’s 6-ball review where the person felt almost duty bound to award such a mark. Well, I returned here yesterday, almost four years to the day since my last visit, and was just blown away by the place. Nothing has changed with regards the infrastructure, except the addition of the odd tee such as a new low one down by the Firth at the 8th hole - and I’m still not a great fan of the stretch of holes along Loch Evelix, played into the prevailing wind between holes 11 and 15. What has changed is the conditioning of the course, which is simply sensational with really crisp, springy fairways and beautiful grass paths cut through wispy fescue, providing a green magic carpet ride from green to next tee at every hole. It’s far from resort golf too with several long carries off the tee (like at the 11th and 14th) to contend with. Poa greens -- perfectly acceptable elsewhere, of course -- are not in keeping with the rest of the course, however, and I understand that a program of overseeding is in place to have them converted to “proper” links putting surfaces (like the current 10th green). Once that happens, Skibo Castle should be nudging towards a place in the Scottish Top 20. I’ve been very fortunate to play the course regularly over the past 7 years as a member and I agree with the comments posted below. The shift from 2006 to 2008 and then to the current day is dramatic. Where as in 2005 (when I first visited) Skibo was a magnificent Highland hospitality experience with an interesting golf course as a side show, the course now stands up in its own right. I haven’t written a review on any site before, but having benefitted from the opinions of others on the top100golf site when planning trips and recognizing how little information is available on the Carnegie Links I felt compelled to share some thoughts. For those who haven’t visited before, it’s a unique set-up. One arrives along the low road running alongside the Dornoch Firth and leading to the former site of the Meikle Ferry. Once inside the gates the experience is first class. The clubhouse is relaxed and well laid out, practice facilities are great and the course is invariably quiet. The views on all sides are stunning, particularly looking across the water towards the Struie Hill and down the Dornoch Firth towards Bonar Bridge. The bulk of the estate is across Loch Evelix and while the spa and pool house is visible, Skibo Castle itself is hidden for the most part. For those who have played earlier incarnations of the links (pre-2007) the routing of the course is now much improved. The definition of the holes is much clearer and this has been achieved by a combination of contouring and extensive planting and the strategic aspects of a number of the holes have been strengthened, i.e. ; new tee and improved dog-leg on 2, better strategic bunkering on 3/5, split fairway on 7, lengthening and tightening of 10, new driving lines on 12. The closing holes remain really strong with a 16 a muscle par 4, 17 a heavily bunkered short par 4, eminently drivable from most of the tee boxes, but often played in a stiff left-right crosswind and 18 is a great risk-reward par 5 with testing shot into a visually challenging, well contoured green. The views have always been spectacular and the condition of the course has changed beyond all recognition. The pictures on this site for example are significantly out of date, especially the oft referred to par 3 6th hole. It’s difficult to gain access which in itself is a conundrum, how do you allow genuine aficionados to share in the experience of a fantastic course, while still preserving the tranquility that is valued by the membership? I believe that they’re considering piloting limited visitor tee times, so possibly worth a call to them. The ambience is genuinely friendly and there’s not a hint of stuffiness. The staff, whether on the golf house side or the course management side are all exceptionally knowledgeable and are mostly all talented and experienced golfers themselves. I’ve played all of the top 10 Highland courses on several occasions and I’ve also been round most of the UK’s top 25 tracks as listed by this website. I’m reluctant to offer an opinion on where Skibo fits into the charts, what I am clear on is that with regard to the Highlands, Royal Dornoch is the standout number one golf course and is truly world class. I would rank Castle Stuart and Skibo very close to each other in second place (Skibo with just a nose in front) and Brora in 4th. Please don’t interpret that as damning others in the Highland top 10 with faint praise. They’re all fine courses and Durness, while not mentioned in the top 10 is a big favourite. That’s assessing the above mentioned as golf “courses”, in terms of golf “experiences” there’s a few that are guaranteed to delight, first tee times at Royal Dornoch as the sun breaks over the East facing Links and an empty track opens up in front of you. A round finishing into an early summer evening on the Old Course as the town is going about its business and several others. Skibo consistently delivers as a golfing experience regardless of the time of day, season or weather. For that reason above it’s a very special place and one that I hope you get to experience. Really enjoyed youre review of Skibo and would have to say youre ranking is spot on - Skibo used to host a competition for non members but that was a quite a few years ago so havent played it since the course upgrades - I thought it was great back then ! Have driven past a few times just for a look though and it looks first class. Hope youre right about them piloting limited visitor tee times as would love to go back. Brora Golspie Dornoch Skibo Tain - Golfing heaven. Yes its difficult to get on to and you have to count yourself very lucky to get on. But the rating this course gets is plain wrong. I'm not a big fan of putting courses into an order because its pretty hard, but in this case, 50+ courses better in Scotland? You are kidding.7 better in the highlands? No, categorically not the case. I’ve played most of them and I think subjectivism aside, it must be in the top ten.Skibo has arguably just two holes that do not border water. Two! Name another course worldwide that can compare with a design like that ?Now romanticism aside, the course design and condition are pretty exceptional. IIts a pretty tough test that makes great use of some amazing terrain. There really are no weak holes and some fantastic variety. The service in the clubhouse and staffing is excellent. Some courses make you feel like a millionaire, this makes you feel like a billionaire owner for a day. Completely agree. Hard to get on, the course was like be the first one to play a world class course. No divots, ball marks and no signs of previous play. Members and staff were wonderful. Can't say enough great things. Except, GREAT COURSE.